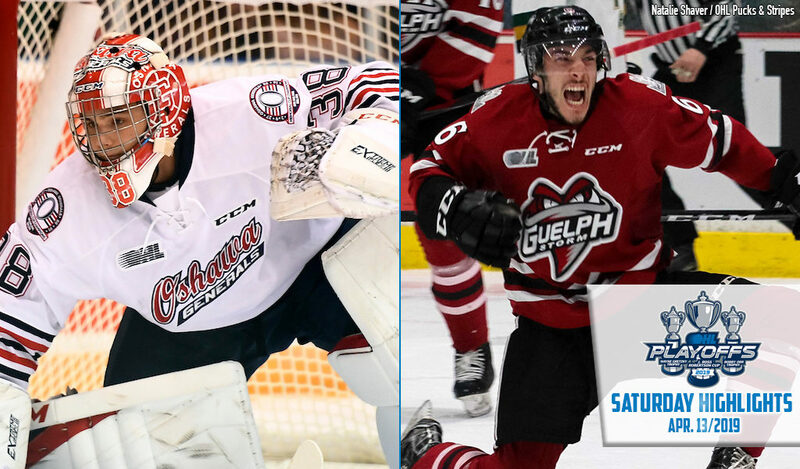 Defencemen Jack Hanley (1) and Sean Durzi (1) scored back-to-back goals late in the second period before Domenico Commisso (3) found the back of the net 1:50 into the third, shifting the momentum as the Guelph Storm defeated the London Knights 5-3 on home ice to force Game 7. 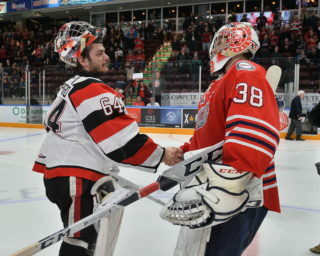 The Storm fell behind 3-0 in the series but have roared back with three straight wins, overcoming a deficit in Game 6 as Isaac Ratcliffe (3) and Nick Suzuki (9) also got in on the scoring. Liam Foudy (5), Billy Moskal (3) and Adam Boqvist (10) provided London goals. Boqvist’s 10th leads the OHL Playoffs as he becomes the first blueliner to score 10 in the postseason since Guelph’s Kevin Klein in 2004. MacKenzie Entwistle and Owen Lalonde each had two assists for Guelph while netminder Anthony Popovich provided 26 saves. 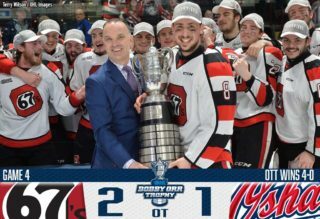 London and Guelph will meet in Game 7 in London on Tuesday for the first time since 2004 when the eventual league champion Storm defeated the Knights by a score of 6-3 in the Western Conference Final. 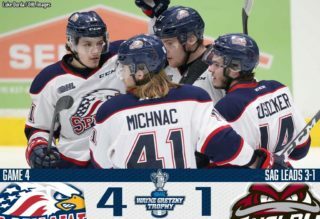 Brandon Saigeon set up Danil Antropov (2) for the power play game winner 7:01 into the third period as the Oshawa Generals earned their third straight win and took a 3-2 series lead over the Niagara IceDogs with a 3-1 road win in Game 5. 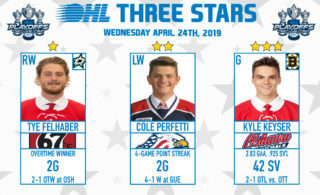 Boston Bruins prospect Kyle Keyser made 36 saves behind other Oshawa goals from Cole Resnick (4) and Nando Eggenberger (4) as the Generals are one win away from the Eastern Conference Final. Former Generals captain Jack Studnicka (5) scored the lone Niagara goals as the IceDogs outshot the Generals 37-26 before a sold out crowd of 5,300 in St. Catharines. The IceDogs poured it on in the third period, outshooting Oshawa 17-6 but they couldn’t solve Keyser and head to Oshawa for Game 6 on Monday with their backs against the wall. Jason Robertson will return to the lineup after serving a one game suspension.